Both baby comforters and crib bumpers cause a suffocation hazard. 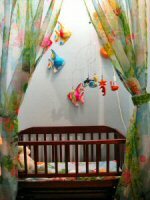 If you want one of those to make the room pretty you can hang the quilt on the wall and tie the crib bumper on the outside. You aren’t supposed to use them in the crib. I confess I still use a baby comforter. But I’m old and set in my ways. See notes above. This is not a miracle product with magical abilities. Just make some. Just try it, making a quarter batch of the no-grate stuff is just pour and done. You will want a changing pad at some point, but to start you can use a towel on the bed or couch. You don’t need a changing table, you just need a changing pad to put on a dresser. If you do get a changing pad it should be contoured so it is harder for the kid to roll off. 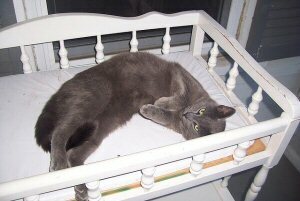 That being said, you never leave a baby on the changing pad/dresser/any height. If you have to lean away you keep a hand on the baby. Babies are experts at knowing exactly the wrong moment to develop new and astounding abilities, like becoming magic jumping beans. And cats are the ones that always land on their feet, babies land on their heads. If you’re not going the towel route for a changing pad, then you should have two changing pad covers (to have one to put on while you wash the inevitably poopie other one). Just don’t get off white. Get white, so you can bleach it, or darker colors. You do want to invest in a 3-in-1 that converts into a toddler bed. I just included a cradle swing in my list, trying to keep it to a minimum. 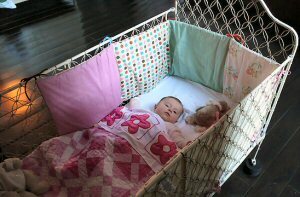 You will want somewhere in the bedroom where the kid can sleep, and hauling the cradle swing around is a pain. I’m paranoid and have to have the baby close enough that I can reach out and feel that’s she’s still breathing. With baby #3 I just rolled the crib up to my side of the bed. With baby #4 I got a bassinette cheap at a yard sale, but the baby wouldn’t even use it until three months. I ended up buying another swing at a yard sale. Babyproofing is very important for safety. However, babies don’t start to toddle until anywhere between 9 and 18 months. This stuff can wait. You don’t need these, regular towels work just fine. But what toddler hasn’t used a hooded towel as a cape and become Super Nakey Baby? Luckily this is another popular baby shower item. You don’t need to buy special underwear, just get bikini underwear. If you want to buy maternity underwear you will most likely have to get it online, most of the big box stores have phased it out. 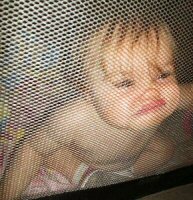 You will want a playard later to have somewhere to put the crawling kid so you can pee/cook/do-something-other-than-watch-the-kid. You don’t need this until they can crawl, around 6-9 months. There are a bazillion playards at yard sales and on Craigslist. The exception to this playard exclusion is that many of them now come with nifty attachments, like a changing pad. If your changing table is on another floor, and you don’t like changing the kid on the couch, this might be a smart spend for you. I didn’t include these because they vary so widely, but it is highly likely that there are seasonal items you will need. What you need will depend on your local climate and the time of year you have the baby. You may just need a light blanket from the dollar store to shade the baby. You may need a baby snowsuit and a car seat cover just to get the kid to the pre-heated car. Baby blankets are something you should get at the baby shower. If you are having a hard time keeping track with your “pregnancy brain”, write sizes and seasons on a sticky note or index card and keep it in your purse (also helpful for yard sailing hubbies). For example, if the baby is due in March you need swim suits in 3 months (like 3 month olds can swim) and 12 months. You will need jackets/coats in 9 months and 12 months. You will want a stroller, or two, but baby can’t even use a stroller until at least 3 months, and that depends on the stroller. If you want one you can get a flat/pram type, but I just put the newborn in a sling or in the car seat carrier. Later on you will want an umbrella type stroller that is easily portable and good for quick trips. You will also want a larger stroller, preferably with a see-through part in the hood, a large cargo bag underneath, and a cup holder on the handle for parents. 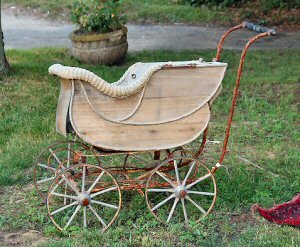 Strollers are available from Craigslist or yard sales. What’s your best baby-life hack?